coming from Munich (Autobahn A8) take exit "Weyarn". Follow the main street until you reach "Miesbach". In "Miesbach" you will reach a big crossroad. Turn left at this crossroad into direction "Fischbachau-Leitzachtal". In the village "Leitzach" turn right. Follow the road through Leitzach valley, pass "Wörnsmühl", "Hundham", "Elbach" and "Marbach" until you finally reach "Fischbachau". At the entrance to the town "Fischbachau", turn left into the street called "Birkensteinstrasse". Follow this street for about 500 m, then you will see the "Alte Bergmuehle" on the right side of the street. Did you miss the Autobahn exit ? No problem ! Follow the A8 to the next exit Irschenberg and then follow the signs until you reach "Miesbach". From "Miesbach" you may follow the a.m. description. Coming from Salzburg (on Autobahn A8), leave the Autobahn at the exit "Bad Aibling". Please turn right into direction "Bad Feilnbach". Shortly before reaching "Bad Feilnbach" turn right into direction "Hundham-Fischbachau". Follow the steep road until you reach "Hundham". Here you turn left into direction "Fischbachau". At the entrance to the town "Fischbachau", turn left into the street called "Birkensteinstrasse". 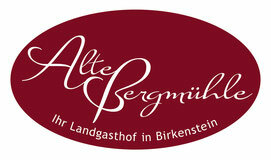 Follow this street for about 500 m, then you will see the "Alte Bergmuehle" on the right side of the street. Welcome ! Take your train to Munich Central Station - here you will have to change trains and take the Bayrische Oberlandbahn (BOB). From Munich Central Station the travel time is about 1 3/4 hour to our local station Fischbachau-Hammer. Please take the wagon Bayrischzell in the BOB, the train will be separated in Holzkirchen. Please let us know if you travel by train. We will be pleased to arrange pick-up at the station for you. Take the plane to Munich Franz Josef Strauss airport. We would recommend that you there rent a car to reach us. Please follow the signs to directions Salzburg. Follow our detailled description how you reach us by car.